The Ultimate Knife is the pinnacle of the Bear Grylls Survival Series. 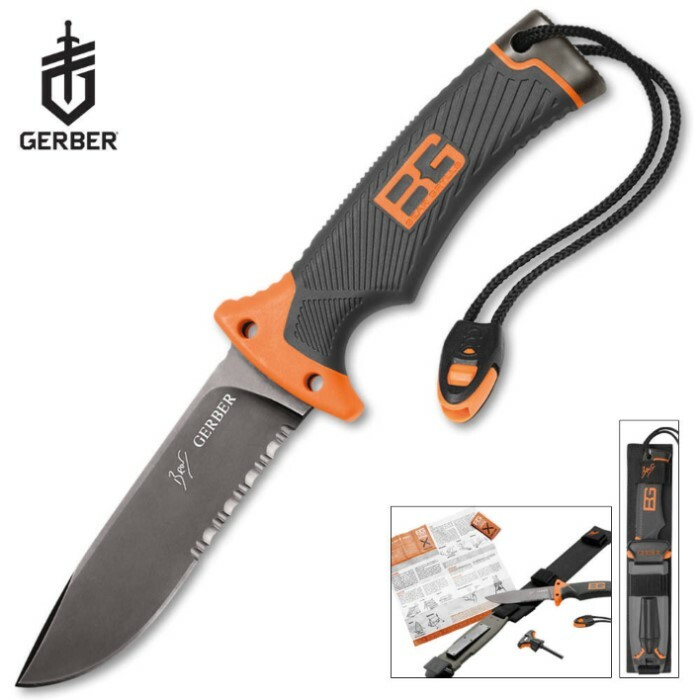 Intricately designed by Gerber and Bear, it"s loaded with innovations that won't be found in any other fixed blade knife. Super useful in the wild, it offers a vital edge to any survivor. Like everything in the series, it also includes Bear"s Priorities of Survival pocket guide. Stainless Steel Pommel - At base of handle for hammering. 4.8 in. blade, 10.0 in. overall. Weight: 14.7 oz. with sheath, 11.2 oz. without sheath. Fire Starter - Ferrocerium rod locks into sheath, striker notch incorporated into back of knife blade. Nylon Sheath - Lightweight, military-grade, mildew resistant. Diamond Sharpener - Integrated into sheath for on-the-go sharpening.